Walter's Dairy was a popular site for many years, now the corner has Bertucci's Brick Oven Pizza. 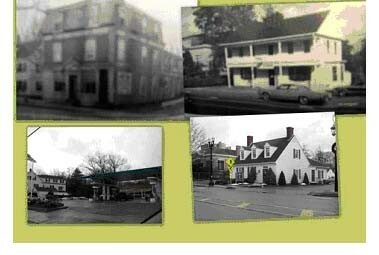 The upper left picture is of the old Hollis Hotel in downtown at the corner of Green and Washington Streets, which was home to Izzy and Al's Restaurant. When the hotel was razed to make room for the expanding Mobil Station, pictured lower left. 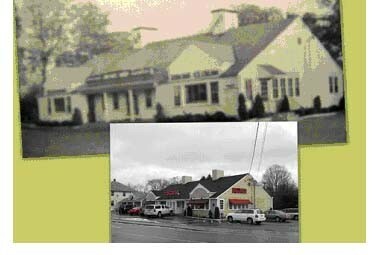 the restaurant relocated to the Holliston Historical Society house next to the library, and then became Al's Restaurant. 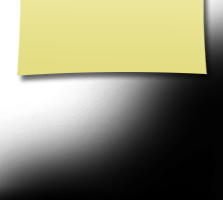 The society purchased and moved up the street to the Asa Whiting House, and some time later the original Burnap house was demolished and replaced with a new house-like building that was home to a bank. The lower right picture in the collage is the new building. 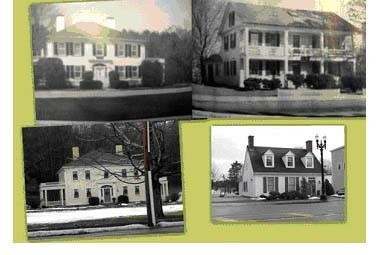 The Holliston Historical Society, founded in 1910, purchased the Burnap house, upper right, in the 1920's, and remained there for over fifty years until they purchased their current property at 547 Washington Street, the Asa Whiting house shown as it was then in the upper left corner of the collage, and as it is now in the bottom left picture. 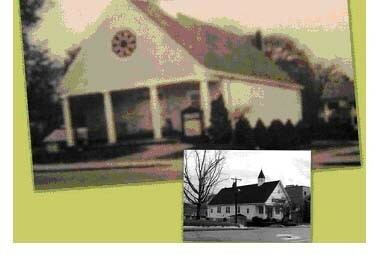 Lower right is the is the site of the original Historical Society house, as it looks today with the new building. 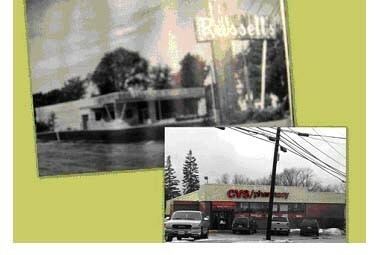 In the late 1950's Russell's Market expanded to a modern supermarket, top picture. Now it is a CVS. It was the FirstBaptistChurch. The church relocated to High Street, and the church building became the Colonial Pharmacy on the upper level, a hair salon in the basement. 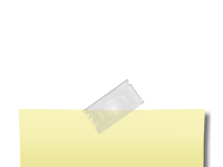 Now it is a bank. Downtown there was an Aubuchon Hardware, upper left, which is now a part of Fiske's. At the corner of Central and Washington, there was a market known as The Mighty Midget, or William's Market. 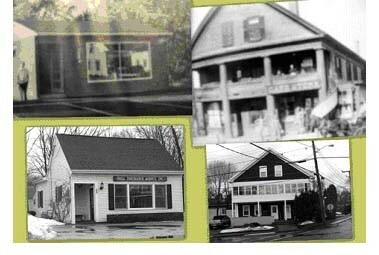 Now it is the Holliston Antique Shop. 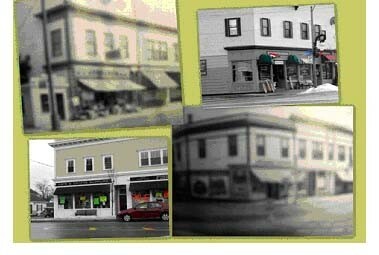 Top photo is the Odd Fellows Block that was home to an Edison Shop, Knowltons Grocery, Jimmy Inches Market and Condon's Hardware. Now the Superette, Studio D and Brick House Realty occupy the first floor. 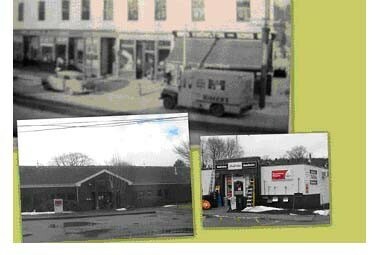 Condon's Hardware is now Holliston Hardware on Central Street, in the building that was the Post Office until the late 1980's. The "New" PostOffce Building was the home of Temple Galleries, a gift and flower shop. That same building was once a roller skating rink, so the story goes. Pictured in the upper right, on the corner of Railroad and Church Streets was the Timothy Daniels' "Cash Store", now an apartment building shown on bottom right. Top left, was a barber shop owned by Joe LaRosa, now it is the office of Shea Insurance on Central Street. There was The Donut Man, then Norman's, and now the ubiquitous Dunkin' Donuts at the same location on Washington Street. Just wait a few days, months or years, and the Holliston of today will be history! Click on the link below for a step back in time.... thanks Ann Honey for the link!